This master bathroom is in a La Jolla home that was originally built in the 1950s. 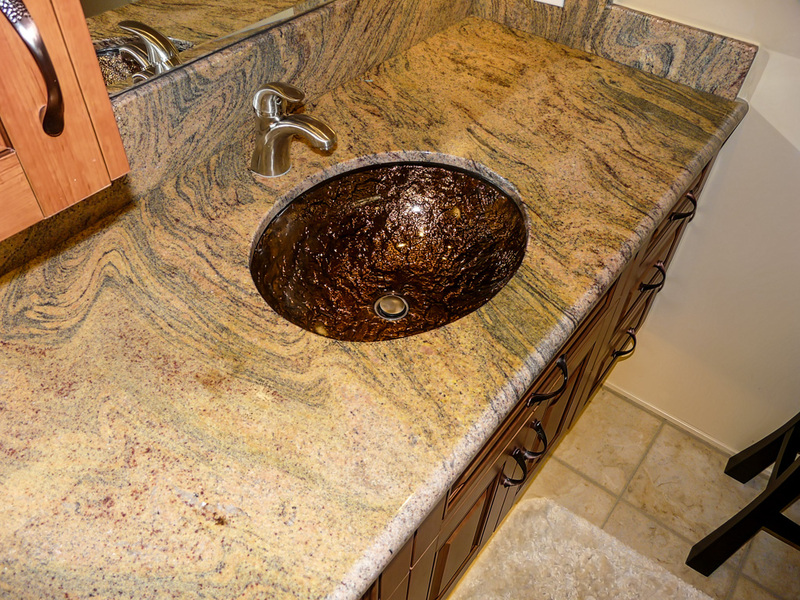 It was a nicely built home for that time, but needed updating for the present-day homeowners. 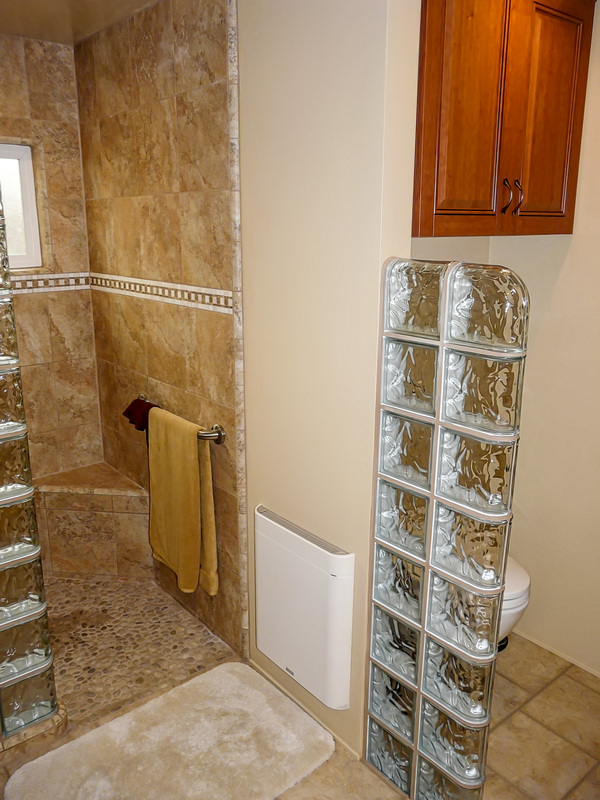 This bathroom was originally much smaller. The compartment area where the toilet is now did not exist prior to the project. The adjoining room on the other side of that wall opposite shower is a guest bedroom that had a closet spanning the entire length of that wall 10+ feet. We essentially cut the closet in half, built a wall midway, and captured the toilet area portion of space for the bathroom. 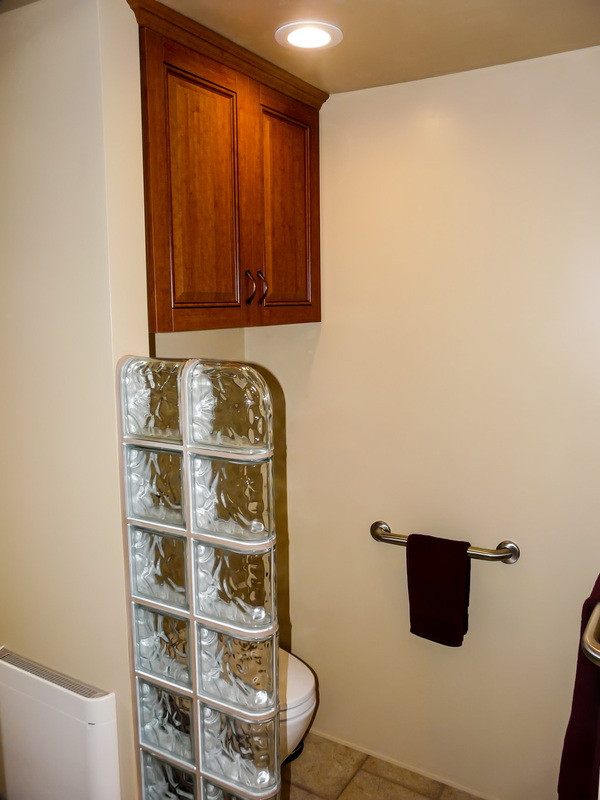 The bedroom still has a decent closet, but now the bathroom has a semi-private toilet area. 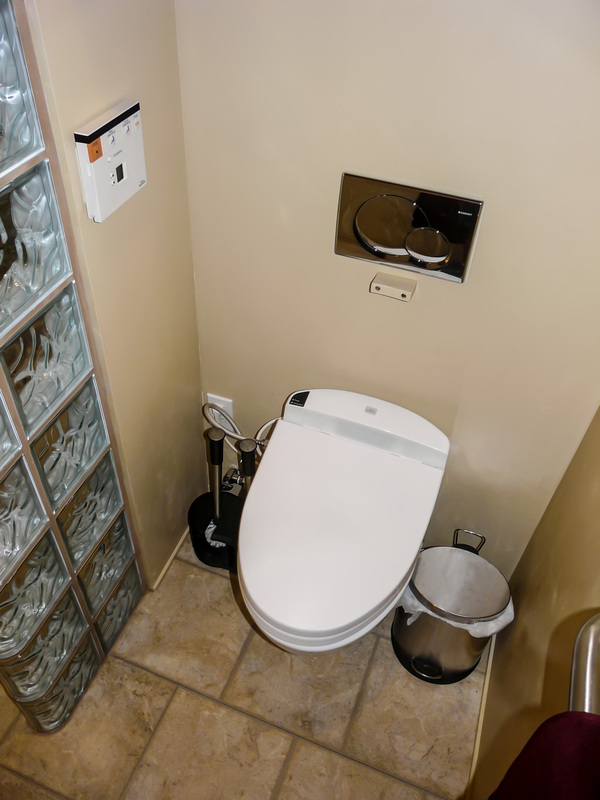 The toilet itself is a TOTO wall-hung dual flush toilet connected to a Geberit European style hidden in-wall tank model. The plate above the toilet is the flushing mechanism and it has two buttons, one for a full flush and one for a partial flush. 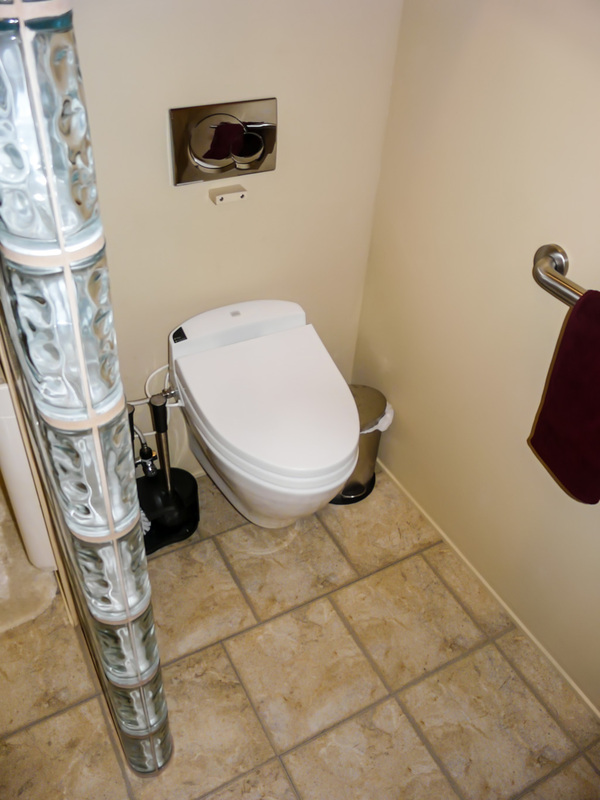 People’s first question about this style of toilet is “how do you go about servicing the tank?” The large metal plate that acts as the flush mechanism is removable and grants access to all the tanks moving parts for servicing. The worst case scenario is what happens if the tank leaks or needs replacement. The thing to keep in mind is the only thing that’s hiding the tank from being accessed is just drywall, so if the tank ever leaked or had any serious issues, it wouldn’t be too much of a hassle to just cut the drywall, open it up, replace the tank, then replace and patch and repaint the drywall. How many toilet tanks have you owned that leaked or needed replacement? I have not, and neither have most people. 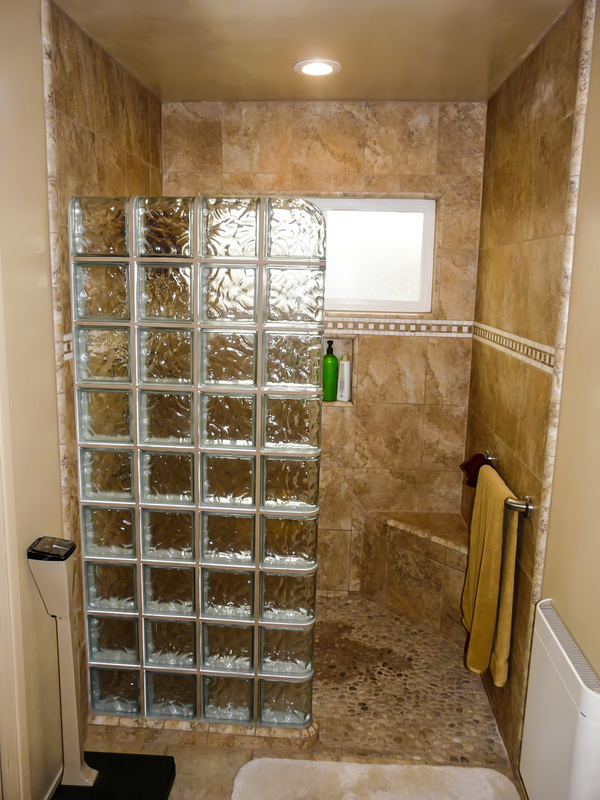 Glass block partitions were used for both the shower and for the toilet area. 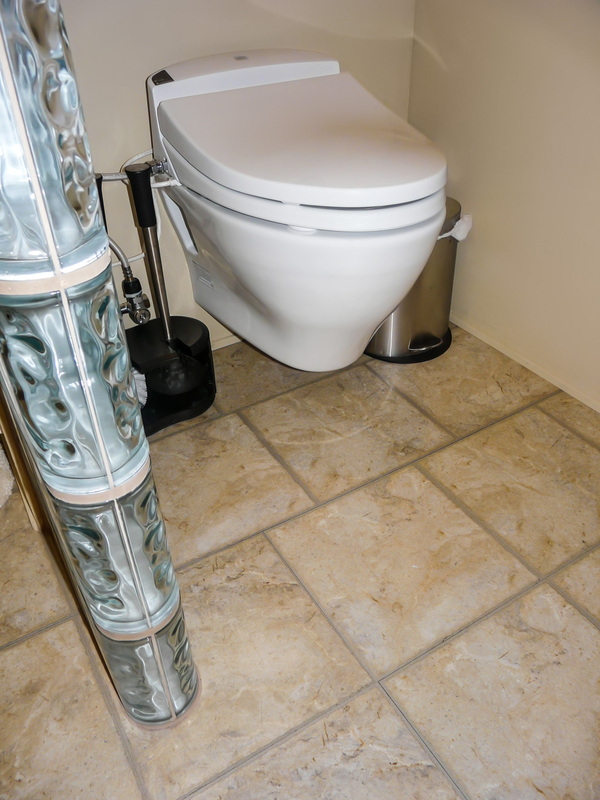 The flooring is a luxury vinyl tile floor that the homeowner installed themselves. 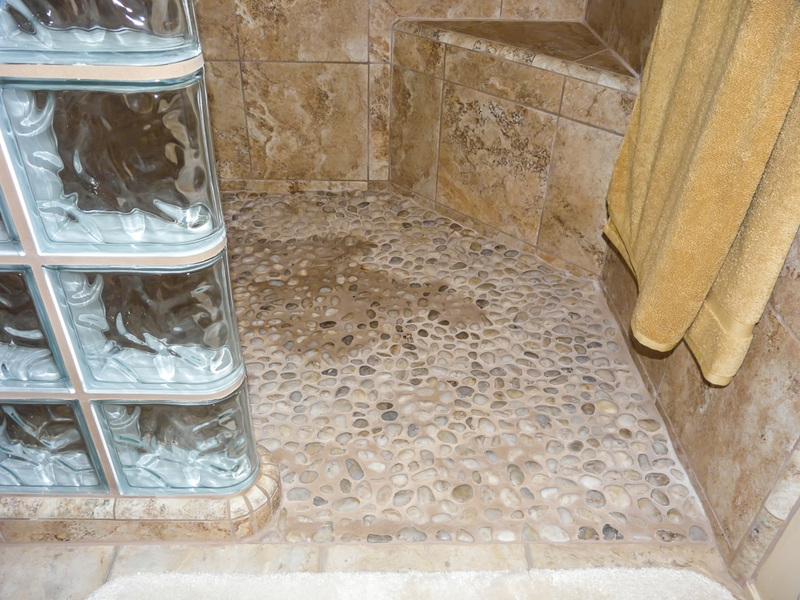 The ceramic tile around the shower is a 12 x 12 porcelain tile, and the homeowner picked a pebble textured tile for the shower floor. 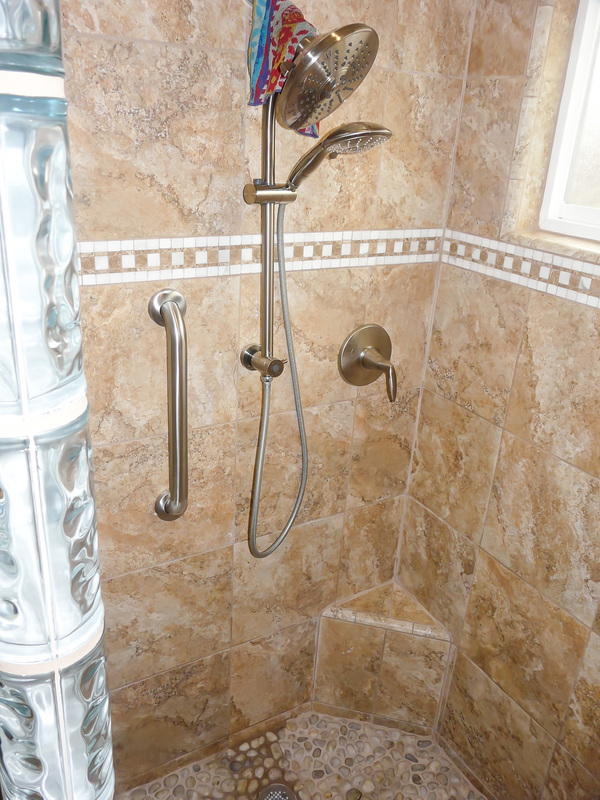 The walk-in (no door) shower is ADA compliant with no dam. 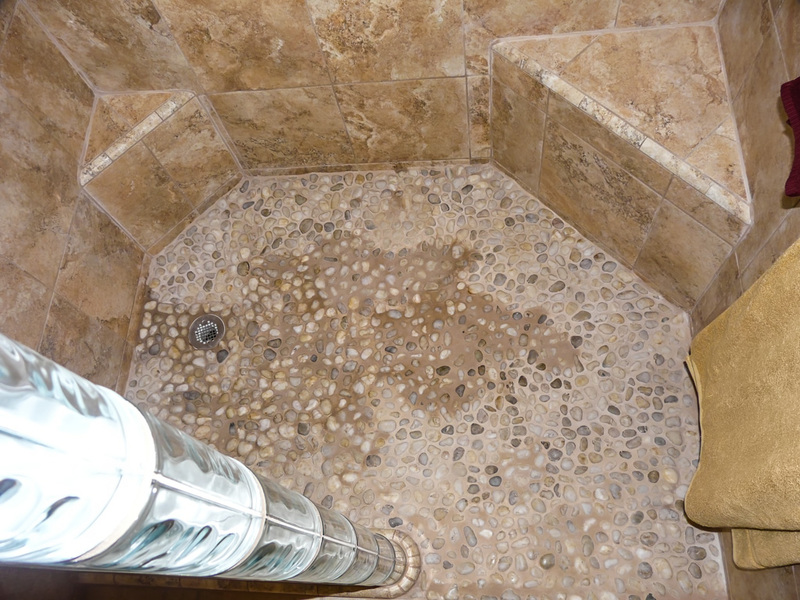 You can still see a little pooling of water on the shower floor as it takes a while for the water to completely drain; the pebble texture doesn’t allow the water to flow as easily as a regular smooth surface porcelain tile would so they have a tendency to hold water a little longer. 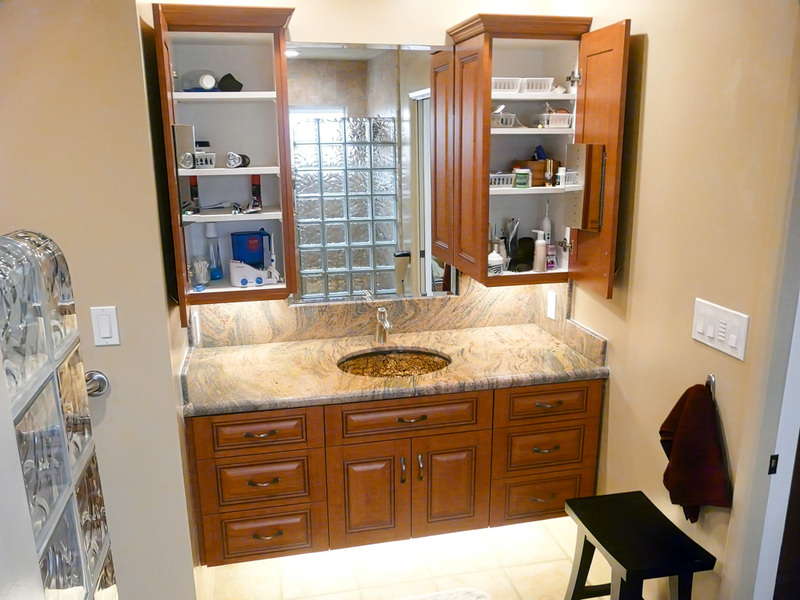 We used LED recessed ceiling lighting and fluorescent undercabinet and overcabinet lights. The ventilator for the bath is connected to a timer in the lighting switch box. 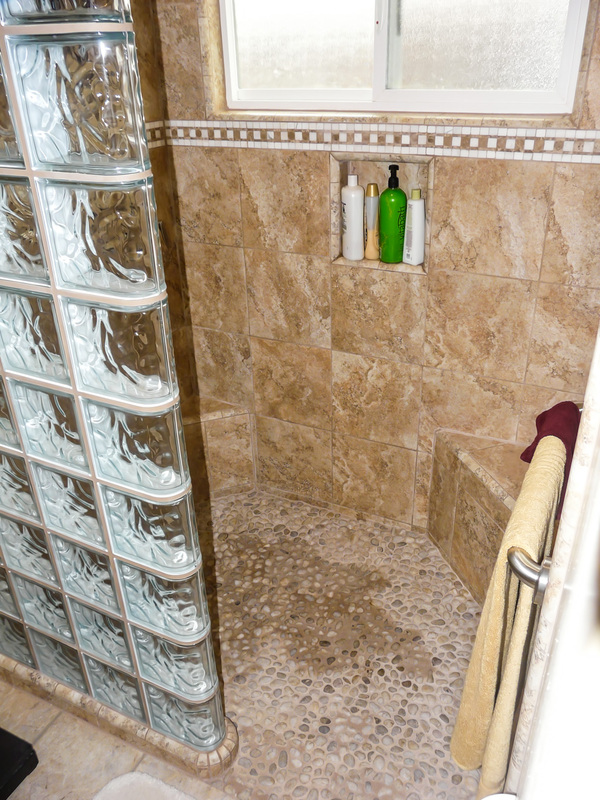 I recommend clients to use the one-hour timer, turning it on when they start to shower and once more when they leave the room, to give the fan plenty of time to do its job of removing the moisture in the air. 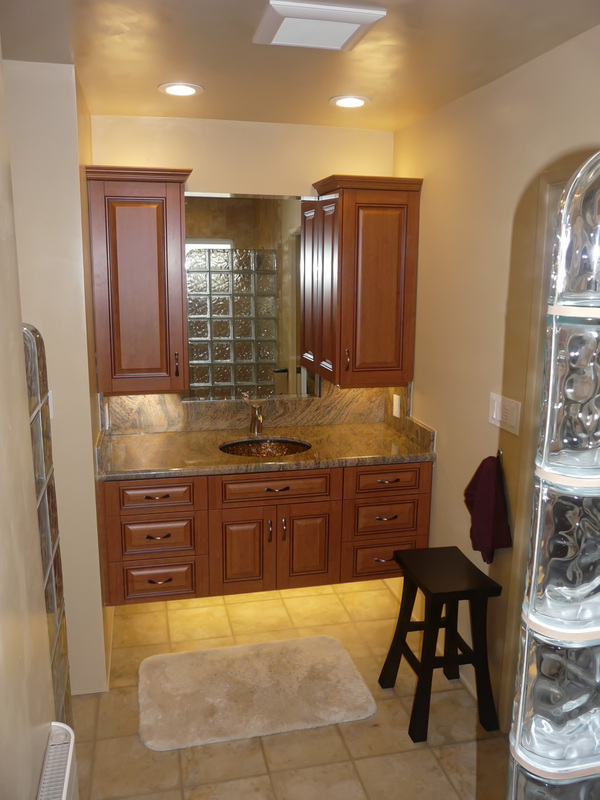 The large white element on the wall outside of the shower is a heater the client provided. 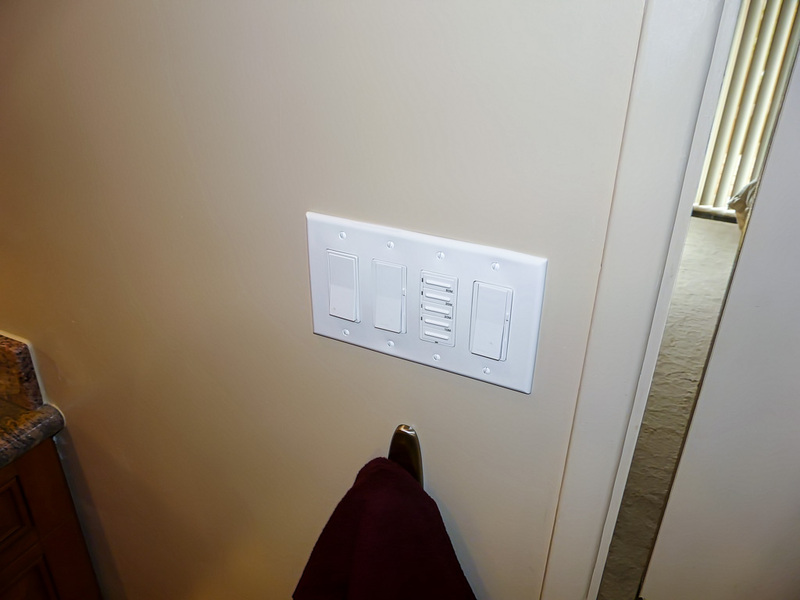 Because this heating unit is heavily dependent on the remote control for operation, we were unable to connect it to a timer switch like we normally do for most of our bathroom remodels. 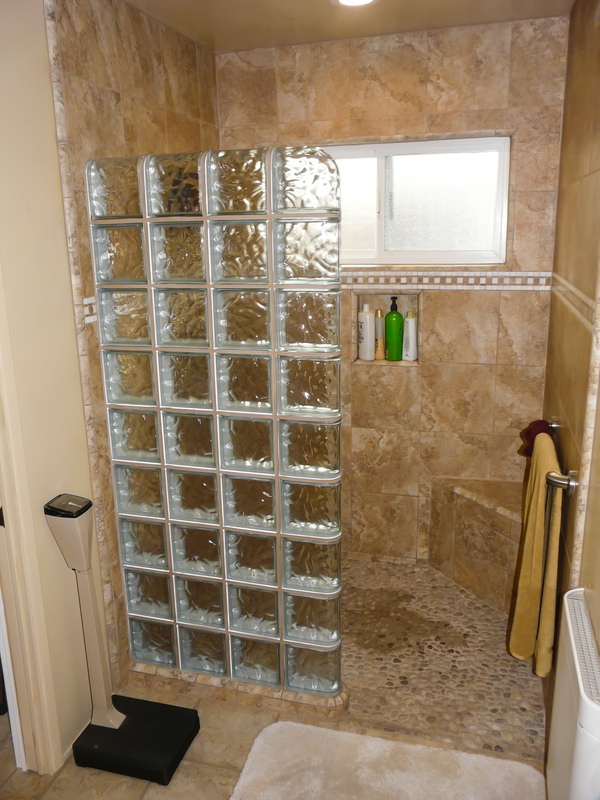 In this case, the client really liked glass block, as you can see we used it in a couple of places for this bathroom. 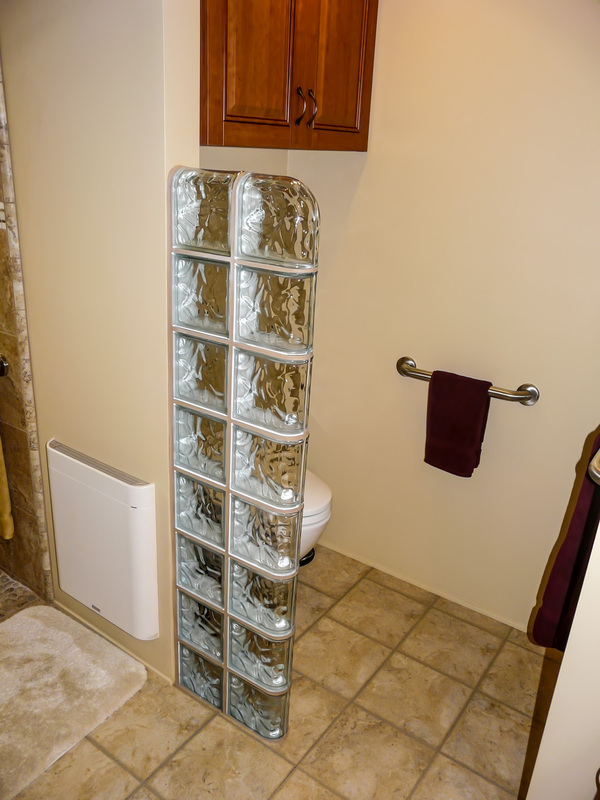 I normally like to hide recessed shampoo shelves on the back side of partition walls in showers, but using the glass block does not allow us to recess shampoo shelves there so they had to be visible on the back wall. Not normally my first choice, but style choices do dictate solutions. 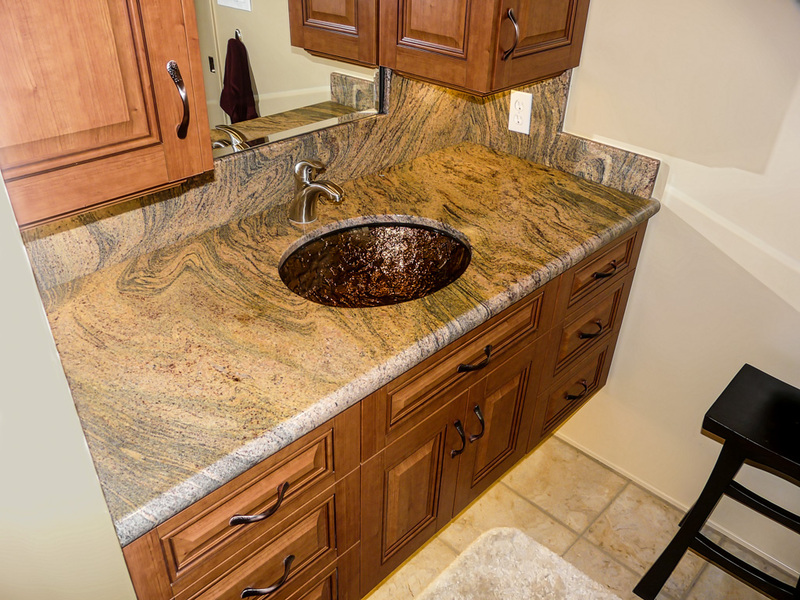 The cabinets are a great example of my functional bath storage. 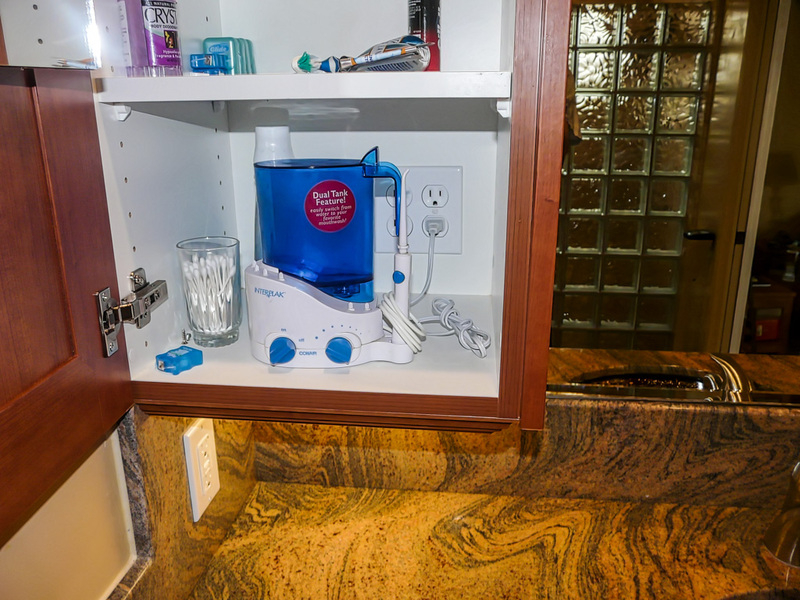 Outlets inside the wall cabinets on each side of the sink for his & hers storage areas allow the clients to open a door, make use of their everyday tools, and simply close the doors when done, eliminating the need to actively put things away. 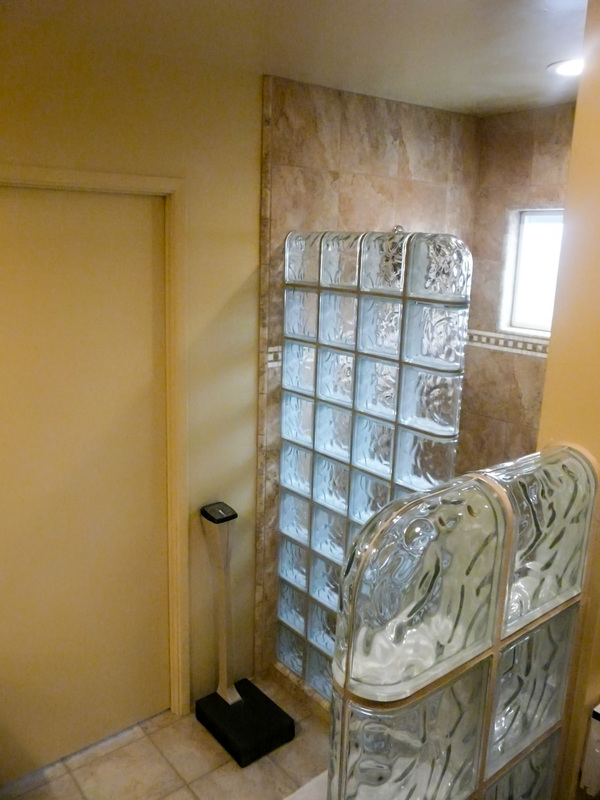 Her side also has an articulating makeup mirror mounted on the back of the door. The husband in this homeowner pair was a really handy guy. He taught industrial arts and wood shop at La Jolla High School for many years. One of my installers that worked this job was actually one of his ex-students, and having the opportunity to reunite with one of his old students was a pleasant bonus for this client. My client also did all of his own plumbing, electrical work, and floor LVT installation, and most of the demolition as well. This was a fun job with good people and a really nice end result that always seems to come when you have great communication. 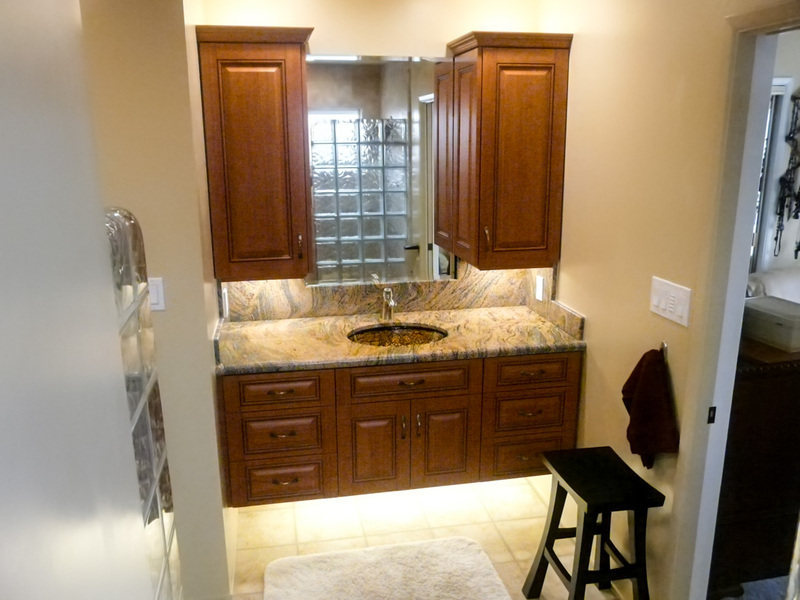 The only thing this client could do today to upgrade this bath is replace the fluorescent under and over cabinet lights with LED versions.